Here is a very fun, creative baby shower candy bar game that is great for large or small groups. You, as the baby shower hostess, can divide the guests into groups of 2, 3 or play the game individually. Print out one game card (below) for each team. 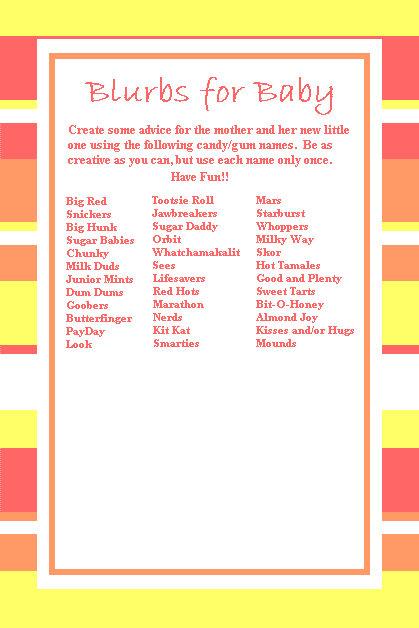 Give them a game card and pen or pencil and have them create some advice for the mother-to-be and her new little one using the list of candy & gum names. They may use the candy names only once. Give the teams 5 minutes or so to write their blurb and at the end have each team read what they wrote. The winner of the game is the guest or team who uses the most candy names in their blurb of advice. If you don't want to be a dum dum, make good use of your sugar daddy during the infant/toddler years. Even though he can't take the baby down the Milky Way, he can help change the mounds of diapers. Even if he's a butterfinger, still make him feel like a Big Hunk so he continues to be one of your lifesavers. Even though men are from Mars and women are from Venus, an infant can give your marriage good and plenty of communication! Enjoy this baby shower candy bar game! Print these baby shower candy bar game cards out on a heavy cardstock, so your game cards look and feel substantial and will be easier to write on.